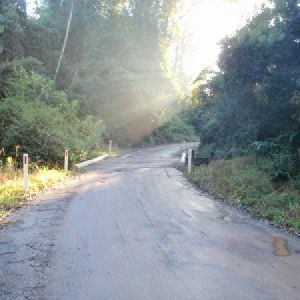 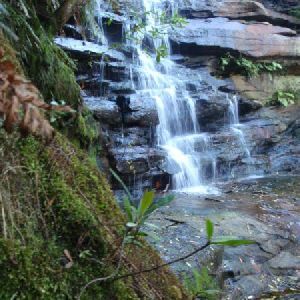 From the car park, the walk follows the road away from the picnic area and soon reaches an intersection with a bush track, signposted ‘Strickland Falls’, ’40 Minute Easy Walk’. 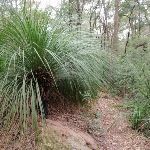 Turn left: From the intersection, this walk follows a bush track away from the road, passing the ‘Strickland Falls’ signpost, to the left. 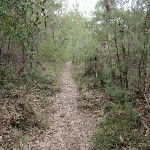 The track initially passes through quite dry forest. 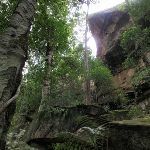 After a while, the walk passes some nice rock overhangs and descends through increasingly moist forest and boulders, to reach the signposted ‘Strickland Falls’. 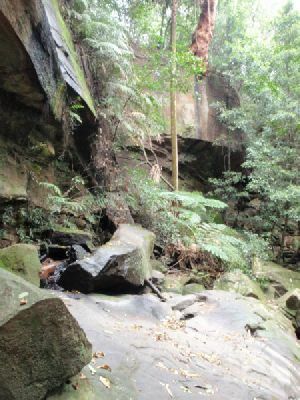 Strickland Falls are a short walk from the Banksia Picnic Area in the Strickland State Forest, Central Coast, NSW. 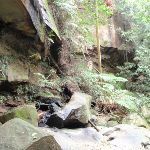 The falls are often just a trickle, but will be more impressive after good rain. 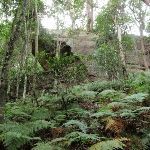 The scenery around the falls is still beautiful with moist rainforest scenery to enjoy. Turn sharp left: From the waterfall, the walk follows the arrow (carved into the rock) along the bush track, going gently down the hill (not up the steps). 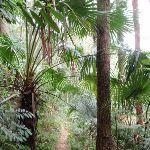 The track meanders through some beautiful scenery with ferns, cabbage palms and boulders. 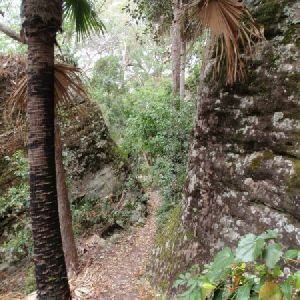 After a while, the walk crosses a gully below some imposing cliffs and continues further before reaching the intersection signposted ‘Cabbage Tree Trail’. 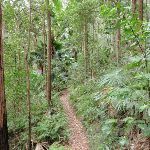 Veer right: From the intersection, the walk follows the ‘Cabbage Tree Trail’ arrow along the bush track, keeping the valley to the right. 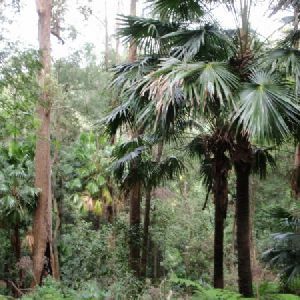 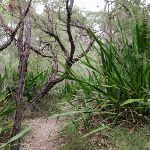 This section of the walk passes some interesting boulders and continues through forest filled with cabbage palms and ferns, before reaching an intersection, signposted ‘Stoney Creek Trail’. 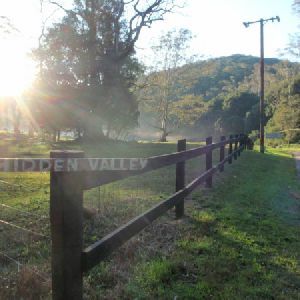 Veer left: From the intersection, this walk follows the level bush track, away from the signpost, keeping the valley to the right. 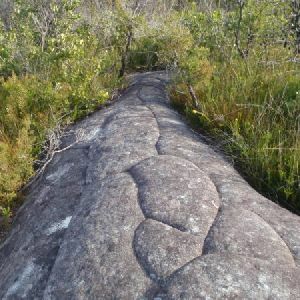 As the track climbs, the vegetation becomes mush drier. 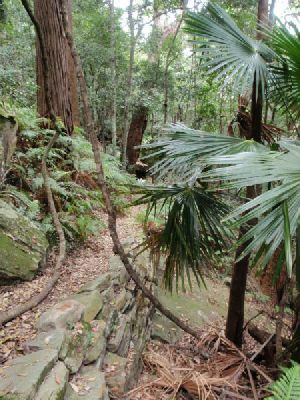 The walk passes through some nice boulders and eventually passes a ‘Cabbage Tree Walk Trail’ sign, to the left, just before reaching the intersection at the end of the Banksia picnic area. 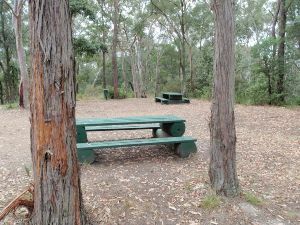 Veer right: From the intersection, this walk goes across the picnic area, and passes around the gate, into the car park (near the end of Strickland Rd in the Strickland State Forest). 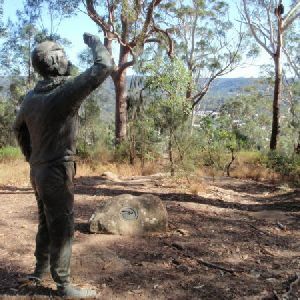 2.6km of this walk has gentle hills with occasional steps and another 340m has short steep hills. 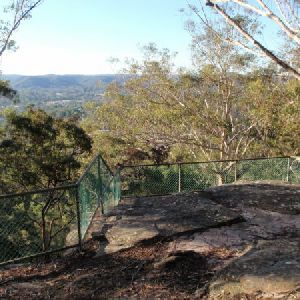 The remaining (140m) is flat with no steps. 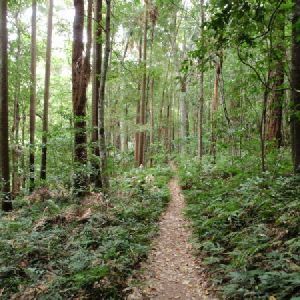 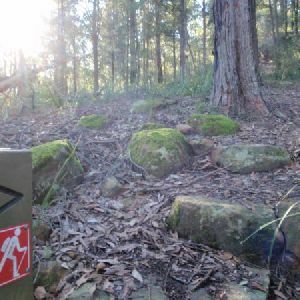 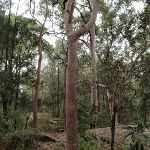 Around 2.9km of this walk follows a formed track, with some branches and other obstacles, whilst the remaining 140m follows a clear and well formed track or trail. 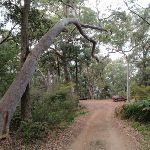 This whole walk, 3km has directional signs at most intersection. 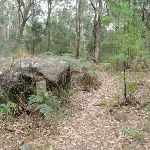 Around 1.8km of this walk requires some bushwalking experience, whilst the remaining 1.3km requires no previous bushwalking experience. 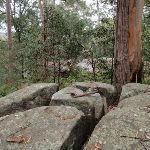 Around 2.3km of this walk is not usually affected by severe weather events (that would unexpectedly impact safety and navigation), whilst the remaining 740m is affected by storms that may impact your navigation and safety. 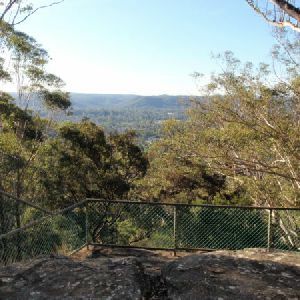 Around 2.9km of this walk has limited facilities (such as not all cliffs fenced), whilst the remaining 140m is close to useful facilities (such as fenced cliffs and seats). 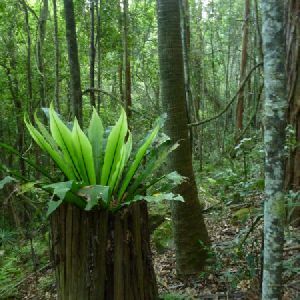 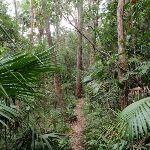 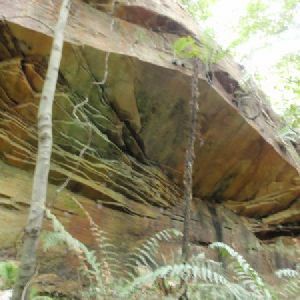 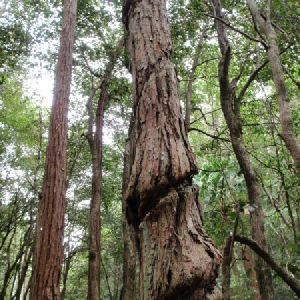 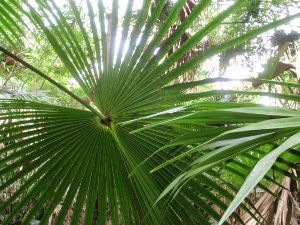 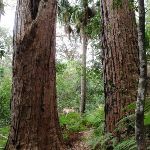 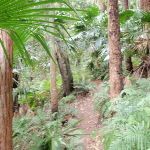 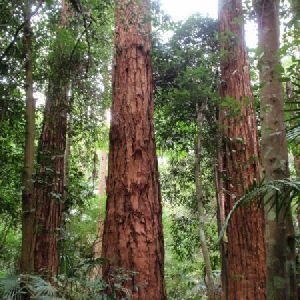 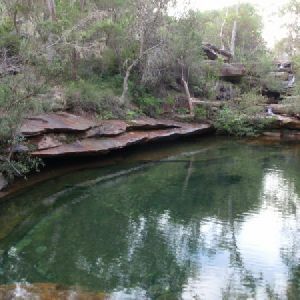 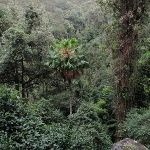 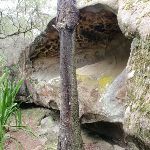 A list of walks that share part of the track with the Strickland Falls and Cabbage Tree loop walk. 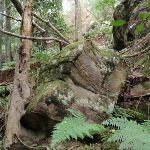 A list of walks that start near the Strickland Falls and Cabbage Tree loop walk. 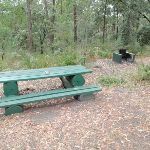 http://new.wildwalks.com/wildwalks_custom/includes/walk_fire_danger.php?walkid=nsw-stricklandsf-sfactl Each park may have its own fire ban, this rating is only valid for today and is based on information from the RFS Please check the RFS Website for more information.